There are two types of AMD: dry (atrophic) and wet (neovascular or exudative). A lot of AMD starts as the dry type and in 10-20% of people, it advances to the wet type. Age-related macular degeneration is always bilateral (i.e., occurs in both eyes), however does not necessarily advance at the same rate in both eyes. It is therefore possible to experience the wet type in one eye and the dry enter the other. Macular degeneration, also referred to as age related macular degeneration, is the leading cause of legal blindness, accountable for 50% of all cases of blindness. It is possible to lower the risk of losing sight from macular degeneration by embracing a healthy lifestyle and routinely having your eyes tested and macula inspected by an eye health expert. The dry (atrophic) type impacts around 80-90% of people with AMD. Its cause is unidentified, it tends to advance more slowly than the wet type, and there is not– since yet– an approved treatment or treatment. In dry age-related macular degeneration, little white or yellowish deposits, called drusen, type on the retina, beneath the macula, causing it to weaken or deteriorate with time. The wet/neovascular type affects roughly 10-15% of people with age-related macular degeneration, but represent approximately 90% of all cases of severe vision loss from the disease. 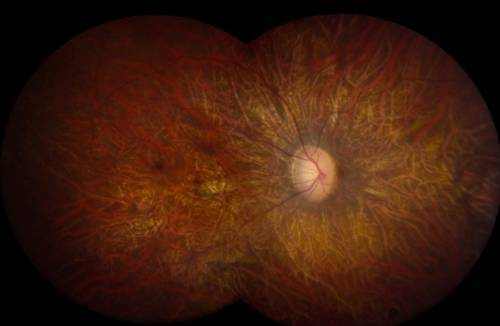 In wet age-related macular degeneration, abnormal blood vessels under the retina begin to grow toward the macula. Since these new members vessels are unusual, they have the tendency to break, bleed, and leak fluid, damaging the macula and triggering it to lift up and pull away from its base. This can result in a fast and severe loss of central vision. In order to receive approval from the U.S. Food and Drug Administration (FDA), a brand-new drug or treatment need to be proven to be both safe and effective by undergoing a rigorous series of regulated unbiased research studies. To prevent bias, neither the patient nor the inspectors can understand which patients got the real treatment and which were the untreated (or “control”) topics. These are called “double blind” or “double masked” studies and normally yield the most reputable outcomes. The medication is coded and patients are positioned at random into either the treatment or control group. When the study is concluded, the code is revealed and it is then possible to determine who received the actual drug and who got the non-active compound, or placebo. In Phase I scientific trials, researchers test a brand-new drug or treatment in a small group of people (20-80) for the very first time to assess its safety, determine a safe and efficient dose range, and recognize possible side effects. In Phase II medical trials, the research study drug or treatment is provided to a larger group of people (100-300) to figure out if it works and to additional evaluate its safety. In Phase III studies, the study drug or treatment is provided to even larger groups of people (1,000-3,000) to validate its effectiveness, screen side effects, compare it to frequently used treatments, and gather information that will allow the drug or treatment to be used safely. In Phase IV studies, after the Food and Drug Administration has approved the drug, continuing research studies will determine additional details, such as the drug’s risks, side effects, advantages, and optimum use.